Sorry to read that you are not well - hope you get better soon. Thanks for still posting up a wonderful project for us to all admire! I LOVE that chair too (and the BP with the faded chandelier). Take care... such an elegant card. Oeh, your cards are truly amazing!!! I have had a wonderful look around and I love all that I saw!! So I immediately became your follower, oeh, I am very sure I won't regret this and will get loeads of inspiration from your blog!!! Thanks for putting all these lovely cards online! hope you feel better soon, Lucy. sending you hugs. very pretty card as always! Because of your wonderful cards, I became a follower a few minutes ago. wow, every card is such an inspiration! Thanks for sharing. Sorry, that you´re sick :-( Hope, you will feel better soon! Very elegant. Sorry to hear you are under the weather. Hope you feel well soon Lucy. We also have Flu in our home, guess all the snow brings the Flu season with it. Gorgeous card. Thanks for your sweet sweet comments on my card, means a lot to me. What a sweet card that says so much. Take care hope your feeling better soon. I hope you are already feeling better. 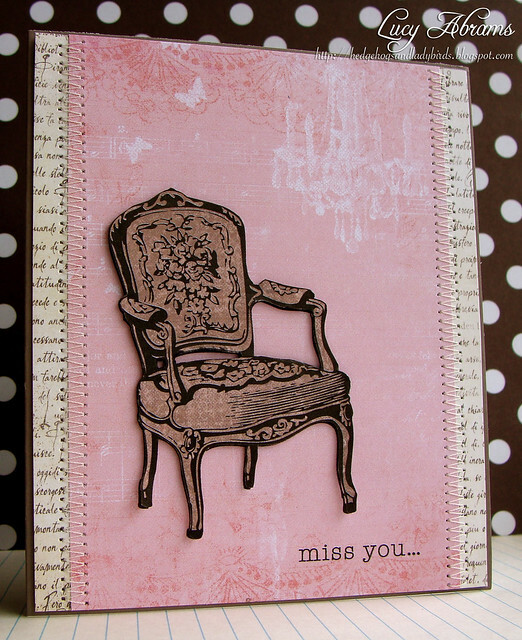 I love this pink card. So lucky for us you got carried away!. Wonderful cards, each and every one. Thanks. I love each and every one of your cards. I'm SO inspired!! TFS! omg these are all gorgeous!! I love what you did with that telephone image. And the last card is totally my style - love it!